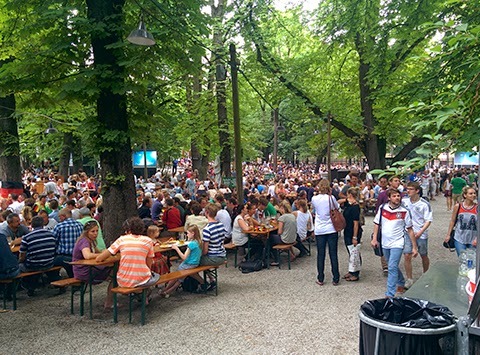 FIFA World Cup fever was very much underway in Germany when we hit Munich on July fourth. We arrived in the Bavarian capital just after 6am, having spent a rocky night on the train from Vienna. Tired and in desperate need of a shower, we wandered around the city and took a bus tour to kill the time until we could check in to our hotel after lunch. 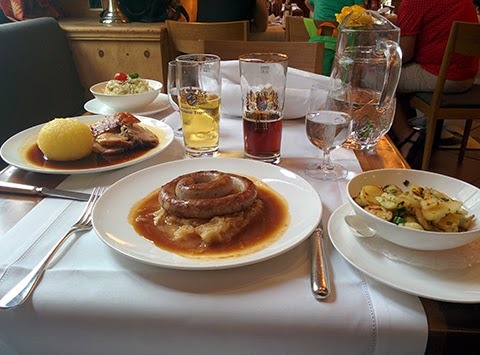 Once rested and washed up we headed off for the quintessential Munich experience – a tasty beverage at the Augustiner-Keller Biergarten – only to be disappointed. That place was packed! Clearly the top spot in the city from which to watch the France vs. Germany quarter final. A futile ten-minute search for a table established that there really was no room at the inn, so we retreated and found a restaurant around the corner serving traditional food (roast pork and potato, sausage and cabbage) and a new favourite with which to wash it all down; König Ludwig Dunkel. Prost! The next morning dawned drizzly and grey – perfect museum weather. We walked around the city for a bit, taking in Karlstor, Saint Michael's Church, the Frauenkirche, some kind of festival in Marienplatz and the Neues Rathaus, before heading up to the Alte Pinakothek. 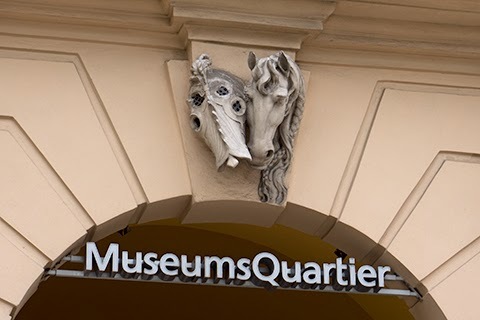 This museum is one of the oldest art galleries in the world and houses the most comprehensive collection of German Old Masters anywhere. Our favourites included Adam Elsheimer's The Flight into Egypt and anything by Flemish artist Peter Paul Rubens. After lunch we hit up the Neue Pinakothek – the flasher younger brother of our previous stop. We are both unapologetic Goya fans, whether it's Saturn caught in filicide or a simple plucked turkey. Of special note were also Van Gogh's Sunflowers (1988) and a painting by Manet of Monet painting in a boat. We see your meta and we appreciate it. Munich is known by many as a one-visit-is-enough kind of city. To tourists it appears clean, orderly, very nice, certainly, but not super exciting. So if, like us, you plan on going there once but probably never again, we recommend you make time for a stop at the BallaBeni ice cream shop on Theresienstraße. 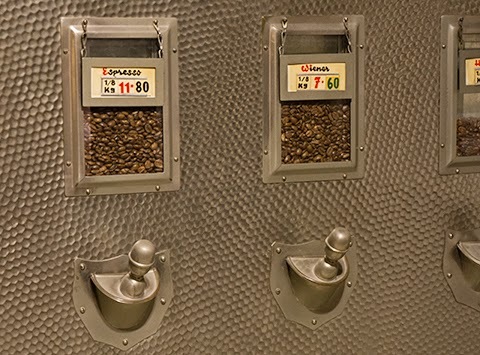 It's conveniently just around the corner from the Alte Pinakothek, and you won't be disappointed (if they have the chocolate and ginger flavour available, take all of it). To understand anything about this part of Germany you need to know a little bit about the Bavarian kings, King Ludwig II in particular. King Ludwig, also known as the Swan King or the Fairy King, held the throne from the age of 18 in 1864 until his death in 1886. During his reign, Bavaria was subjugated by Prussia and subsequently absorbed into the German Empire, but Ludwig mostly stayed away from Munich and state politics. He was a loner, a dreamer, and preferred to spend his time and money on building beautiful fairytale castles in which he could hide from the world and indulge his love of theatre, architecture, and Wagner. 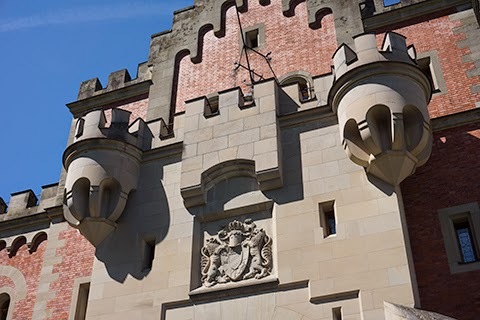 We were fortunate enough to visit two of these castles, Neuschwanstein (the inspiration for Disney's Sleeping Beauty Castle) and Linderhof, a mini Versailles and tribute to the Sun King, Louis XIV of France. Our trip was hosted by a very friendly and knowledgeable local woman named Ana who clearly had a soft spot for poor, misunderstood Ludwig. Burdened with responsibility he didn't want, forced to hide his true nature and accept a royal marriage to please others, he was eventually reduced by crippling social anxiety to eating alone at a table rigged to be drawn up to his dining room from the kitchens below so that he could avoid all contact with his staff. Finally, Ludwig was declared insane by psychiatrists who had never met him, deposed by his cabinet ministers and then carried off in the middle of the night to a secluded manor where the next evening he was found dead in the water. Ludwig's death was declared a suicide by drowning, despite a lack of water in his lungs and the presence, sitting up in the water next to him, of the body of the chief of Munich Asylum, who had also died under suspicious circumstances. Perhaps it is fitting that the ending to this day dreamer's story is one of tragedy and mystery. The next morning we arrived, yet again grubby and barely rested, in Berlin. To our rescue was the SANA Berlin Hotel and its accommodating stance on check in times. We dumped our bags and took a quick shower before heading off for a full day of sightseeing around the city. Stops included the Victory Column (and possible nudist sighting in the nearby park), a walk through the Großer Tiergarten to see the Hyundai Fan Park setting up at Brandenburger Tor, the Berliner Dom, the outside of the Pergamon Museum, the Fernsehturm, and a tour through east Berlin with a guide who kept turning back and winking at us (why?). Tuesday was plagued by the sudden summer thunderstorms that we came to associate with our time in Berlin. Between showers we caught the U-Bahn to Museum Island, grabbed breakfast and a Berliner at a cafe, then walked over to the DDR Museum, a privately-owned, interactive look into daily life in Socialist East Germany. 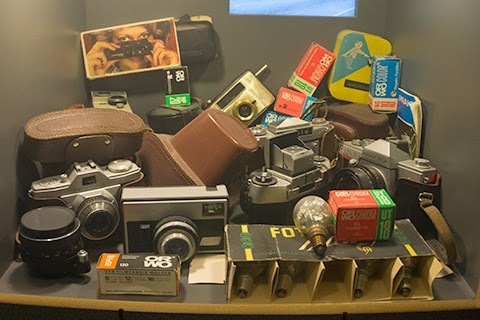 Packed with displays covering topics from school, home and work life to Stasi bugs and Socialist propaganda, this really was an interesting way to spend a morning and well worth the €7 admission fee. For lunch we treated ourselves to currywurst and chips at the Augustiner München restaurant and then headed over to Checkpoint Charlie, the most famous Berlin Wall crossing point during the Cold War. The checkpoint remains an important landmark in Berlin and attracts a constant stream of tourists who line up to take pictures with actors dressed as soldiers stationed outside the replica guardhouse. We were fairly knackered by the time evening rolled around and given the crazy football crowds at the Augustiner-Keller Biergarten in Munich we decided to save our energy and watch the Germany vs. Brazil semi final from the comfort of our air-conditioned hotel. As the match got underway it soon became clear that we were witnessing a historic moment in German football, and when the first half closed with a 5–0 score to our gracious hosts we knew we had to throw on some sneakers and race down to the Hyundai Fan Park to experience the rest of the game with the locals. 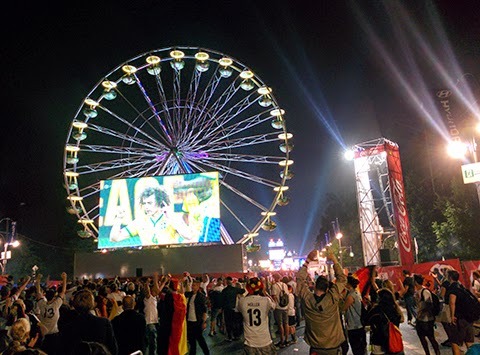 We arrived at Brandenburger Tor just as the second half was picking up, and watched the next three goals on the massive outdoor screens, surrounded by happy but really quite restrained German fans. The Tiergarten was quiet as we walked through it on our way back to the hotel, surprised by the complete lack of drunken hooliganism one would expect at such a big sporting achievement. When we got to the main road however we were pleased to confirm that Germans do actually have feelings, they just choose to express them with constant, hearty car-horn honking. The next day we set off on a much anticipated guided tour of Dresden. Being huge fans of Kurt Vonnegut's Slaughterhouse-Five we knew we couldn't come all the way to Germany without visiting the site of the controversial 1945 fire-bombing, and the commentary provided by our guide, Alex from Perth, was both in-depth and hilarious (when appropriate). The trip started with a two-and-a-half-hour bus ride through the pine forests of Brandenburg down to the Saxony capital. Alex told us about the history of the area, her love of opera, and the wonders to be found in a traditional German bakery. 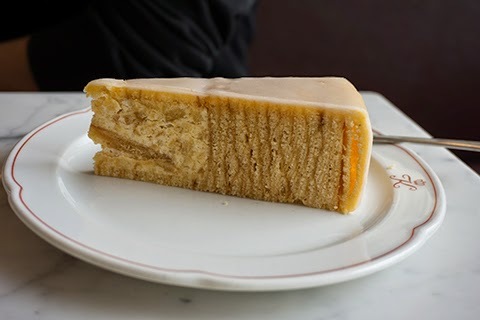 By the time we reached Dresden we were primed to get the most out of our walking tour of the old city, while also keenly anticipating the cultural experience that is Baumkuchen and Eierschecke at Alex's favourite cake shop. Dresden is a beautiful city to walk around, with attractions such as the Dresdner Residenzschloss, Augustus' greeting palace, the Semperoper, a wall decorated with a procession of Augustus' family depicted in Meissen porcelain, and the terrace along the Elbe, nicknamed "the balcony of Europe" by Goethe. Much of Dresden's historical architecture was constructed with a locally sourced sandstone that turns black as it ages, giving the impression that the buildings are covered in soot and creating a sort of melancholy feel around the city. This darkening of the stone has created an interesting effect on the Frauenkirche, a Lutheran church featuring one of the largest domes in Europe, which was destroyed during the bombing. For a long time the East German authorities determined that the rubble be left as a war memorial, so reconstruction of the church only began in 1990 with the reunification of Germany. The building was finally completed and reconsecrated in 2005. As much as possible, original materials and plans were used to reconstruct the Frauenkirche. Each stone was carried out from the rubble, measured, catalogued, and where feasible fitted back in its original place in the structure. The old stone, blackened with age and fire damage, now stands out against the light tan colour of the newer sandstone, giving the church its distinctive dappled appearance. Our final day in Germany was spent at the Sachsenhausen concentration camp in Oranienberg, 35km north of Berlin. 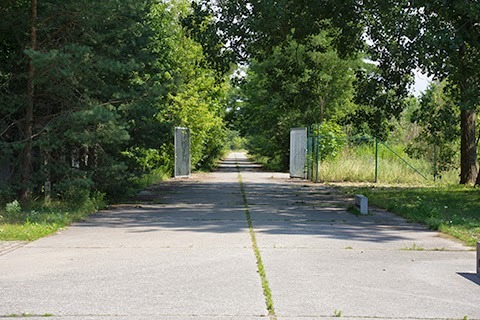 The camp opened in 1936 and was used primarily to house political prisoners through to the end of the Third Reich in 1945. It was also a key training facility for Schutzstaffel (SS) officers who would then go on to oversee other camps. Sachsenhausen was designed by architect Bernhard Kuiper in the distinctive triangle shape, with barracks arranged in an arc to ensure clear lines of sight and thus maximum efficiency for the machine gun post in Guard Tower A. This theme of deliberate planning and concern for total order and control is evident all around the camp, and you are constantly reminded that it was designed and built with a very specific, and disgusting, purpose in mind. One of the most chilling parts of the camp was the preserved foundations of Station Z, the site of the gas chamber, crematorium, and execution room. Prior to its construction in 1939, prisoners sentenced to be executed at Sachsenhausen were taken to an outdoor trench where they were lined up and shot or hanged. According to our guide, the emotional distress caused by organising and then murdering their prisoners face to face became too much for many of the Nazi guards, who began suffering psychological trauma. The solution was an elaborate maze of rooms inside Station Z, where prisoners were brought in through a garage, sat in a waiting room, then individually brought in for what they believed was a medical exam. As the prisoner stood with his back against a measuring stick on the wall, a small window would open behind his neck, allowing a soldier in a hidden room to kill him, instantly and anonymously. Loud music would be playing on a gramophone to hide the sound of the gunshot from the others in the waiting room. A secret door allowed the corpse to be dragged out to the ovens, operated by prisoners forced to participate in the same death ritual they knew they would soon also be subjected to. The visit to Sachsenhausen, while immensely disturbing, was a valuable experience. It is one thing to read about the horrors performed by the Nazis in WWII, and it is another to walk through the main gates with Arbeit Macht Frei sculpted in iron, to see the roll call area where prisoners were humiliated and made to stand for hours on end, and the marching strip where they were forced to test boots on a variety of surfaces, covering up to 40km a day until they collapsed. Along with the administration offices at Guard Tower A, Sachsenhausen also still contains a museum in the prisoner kitchen, the infirmary barracks, the pathology building and mortuary, and other features of the camp. Most of the barracks have been destroyed, but the Jewish barracks, 38 and 39, have been reconstructed and serve as museums. The fact that they still bear the scars of an arson attack perpetrated by neo-Nazis as recently as 1992 only further strengthens the importance of places such as Sachsenhausen as memorials and education sites, now and into the future. You can find our full Germany photo album right here. As far as first impressions go it is hard to top the baggage claim at the Vienna International Airport, where, upon our arrival, giant posters advertised Monet and Klimt exhibitions across the city. That is how we will remember Vienna, as a city of art and culture. After checking into our hotel we took an evening stroll around the neighbourhood. Even in this little area, far from the city centre and under a dark angry sky, it felt like we were in a painting. The colourful, uniform buildings, the perfectly clean and empty streets, the hum of conversation in each restaurant we passed by. It was hard to believe real people lived their lives in such a laid-back state. It was still raining the next morning so we carefully planned a route to the subway, aiming to minimise our time spent exposed to the elements without an umbrella. Luckily there is a rather extravagant hat and umbrella shop in the underground mall at Karlsplatz. 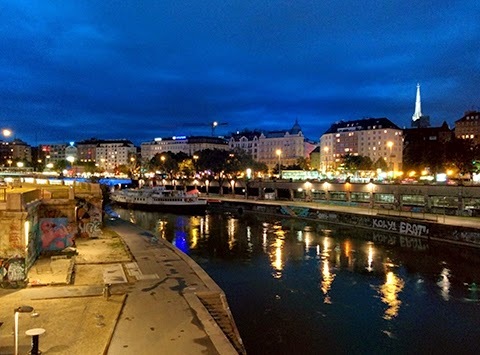 We purchased their cheapest offering and hopped back above ground for a delicious breakfast, confirming that Vienna has not only great architecture but also great food. The Kunsthistorisches Museum was the first of many art museums we would visit, and is easily one of the most stunning, lavish buildings we have ever seen, both inside and outside. It is a shrine filled with works by the most famous names in art history, and yet it was neither crowded nor noisy. We purchased a teddy bear reproduction of Bruegel's The Hunters in the Snow to remember our visit, not that we were worried about ever forgetting such an impressive collection. 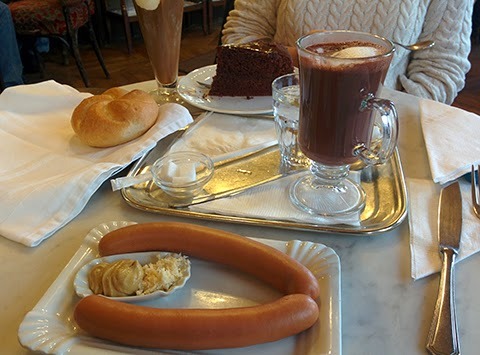 In search of the most Viennese café experience available we cautiously entered Café Sperl and sat down without being seated. Our waitress was, as promised, a little grumpy. The sachertorte, sausage and coffee were, also as promised, delectable. For the afternoon we sedately explored the historical Belvedere palaces, with their interesting mix of modern and classical exhibitions. Continuing the local cuisine trend we visited restaurant Figlmüller for dinner, a commonly recommended destination for foreigners looking to get a plate of schnitzel. And what a massive plate it was. We probably did not need to order the big salad accompaniment. Bratislava, the capital city of Slovakia, lies only an hour east of Vienna, making it a very convenient day trip. We journeyed on an early bus and were at St. Martin's Cathedral, the cathedral of the Roman Catholic Archdiocese of Bratislava, by mid-morning. We walked around the entire of the quirky Old Town area of the city, lead by a very friendly local tour guide. The atmosphere was tranquil, with little more than foot traffic shuffling between the various courtyards and squares. In the afternoon we spent a few hours alone exploring more of this beautiful place, and enjoying the cheapest beer we have yet to find on this planet. We returned to Vienna by catamaran along the Danube, which let us see the many fishing shacks that line the river. Our penultimate day in Vienna was spent marching a large loop around the central city, hitting many landmarks along the way, including the Austrian Parliament Building, the Hofburg Palace, and the Volksgarten that sits in between them. These sights were all radiant and inspiring in the perfect sunny weather. After lunch we took in a huge Egon Schiele collection at the Leopold Museum, located in the incredible public space that is the Museumsquartier. There was even a little bit of Klimt on display to top it all off. After checking out of our hotel the next day we caught the subway to a stop near Schönbrunn Palace, a former imperial residence that boasts 1,441 rooms. We were only able to view a fraction of the inside, but it was exactly as opulent as you would imagine. There was plenty to do and see around the grounds, including a zoo and a charming strudel show. At the top of the hill we rested by the Gloriette structure, which offers a brilliant view of the palace with the city stretched out behind it. In our final evening we were drawn back to the Museumsquartier, this time not for art but for relaxation. Live chamber music filled the air as we laid back and watched the clouds drift by. We departed Austria that night by train, eager to meet our next destination but already missing the contented ambience of life in Vienna. Please check out our Vienna photos here, and our Bratislava photos here.